Factors that increase one’s risk for squamous cell cancer include sun exposure (it is frequently seen in surfers, outdoor construction workers…), light complexion, arsenic exposure, radiation therapy to the skin and immunosuppresive therapy after organ transplantation(especially heart and lungs). They begin as a small nodule and as it enlarges the center dies and sloughs so the nodule turns into an ulcer that may intermittently bleed. The tumor most frequently appears as a superficial surface lesion or a tumor below the level of surrounding skin that causes overgrowth of the overlying skin until it breaks through having a volcano like appearance. It is important to treat squamous cell carcinoma as soon as their are diagnosed because unlike basal-cell carcinoma squamous-cell carcinoma (SCC) has a substantial risk of metastasis (spreading to distant parts of the body via local nerves or lymph nodes). 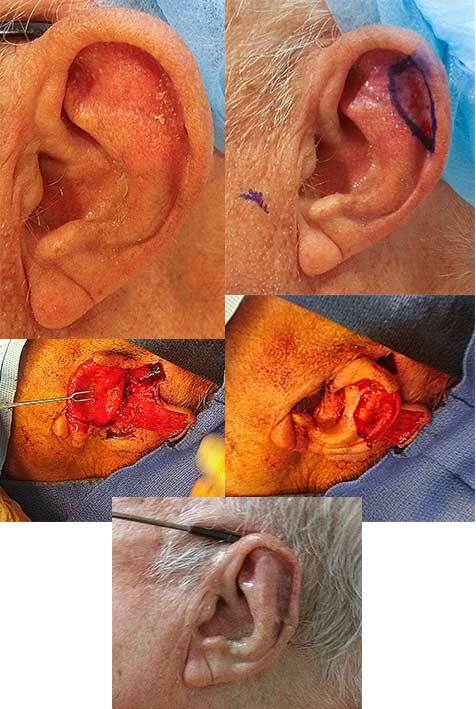 Squamous cell carcinoma of the ear marked for excision, removed and the resulting wound closed with a flap of skin from behind the ear. 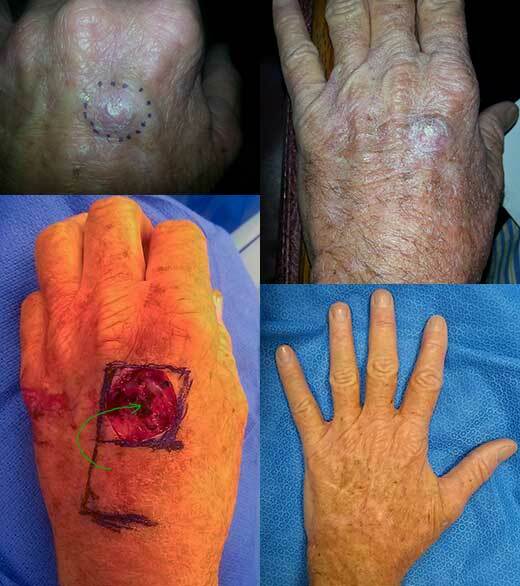 Invasive squamous cell carcinoma of the hand marked for excision, removed and the resulting wound closed with a flap of skin from the back of the hand and a small skin graft from the thigh. The most common method employed by dermatologists to squamous cell carcinoma is currettage(scraping). The cancer is scraped until all the softer cancer tissue is removed. Other non surgical methods available are topical 5-FU cream or Imiquimod. Imiquimod has to be applied 5 times a week for 6 weeks and leaves the patient with a wound that looks worse than the cancer. It can take up to 12 weeks for the wound to heal. Imiquimod is more expensive than simple surgery and are only covered by health insurance in specific cases. Radiation therapy is also used but is mostly reserved for older patients who cannot tolerate surgery or have cancers in areas that cannot be excised. Chemotherapy is only given to those with metastatic disease. Proper care results in greater than 95% cure rates. Recurrent cancers are more aggressive & harder to cure. The recurrence rate is dependent on the entire removal of the cancer (proven by microscopic examination of the excised specimen). However, once you have had one you are obviously at greater risk of getting another anywhere you have skin than someone who has never had squamous cell carcinoma. They are only predictive of future basal cell carcinomas or squamous cell carcinomas of the skin. They are not predictors of any other type of cancer. The benefits of early treatment are minimization of the potential for metastasis.